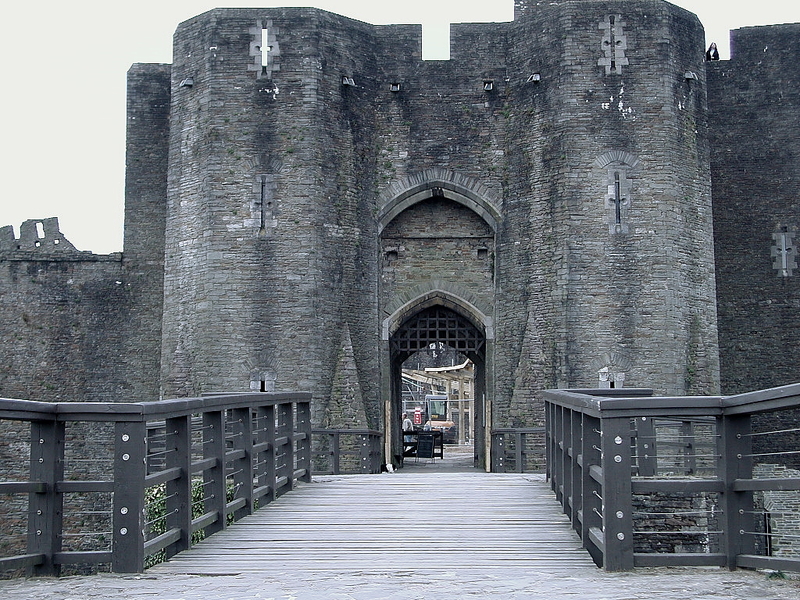 Above: the arms of Gilbert de Clare, and (below) his magnificent castle at Caerphilly. Many modern family names can be spotted drifting in and out of the spotlight of British history across time if one looks closely enough. One such family name, through a combination of intrigue and diplomacy, rose to become the wealthiest family in thirteenth century England, and later members of the dynasty were to influence the country's future by marrying into the Plantagenet royal family. The family in question is that of the de Clares, now remembered through the surname Clare and it's derivatives. Originally a Norman family, they took their name from Clare in Suffolk where their first castle, and the seat of their barony, was situated. By the thirteenth century, the family held vast estates in Wales, Ireland, and twenty two English counties - so there was little chance of the surname becoming isolated to just one area. The first recorded member of the de Clare dynasty was Godfrey, Count of Eu. Godfrey was an illegitimate son of Richard of Normandy, and his son Gilbert was assassinated in 1040 - although as you will see, Gilbert was to become a confusingly common name for sons of the de Clare dynasty. It has been suggested that the de Clares were distant relatives of William I of England, as William himself was the illegitimate son of another Duke of Normandy. Distantly related to William or not, Gilbert's sons accompanied William in his invasion of England in the late eleventh century. They were suitably rewarded for their support - Baldwin de Clare became Sheriff of Devonshire, and his brother Richard de Clare was given control of 170 estates in Suffolk (95 of which were attached to Clare Castle. Although Baldwin did not marry, Richard's marriage to Rohais Giffard produced three sons (Richard, Roger and Gilbert) and two daughters (Rohais and one unknown). Richard and Rohais de Clare also set about building a priory at St Neots (now in Cambridgeshire), which was finished around 1100; Richard never saw the dedication service however, as he died around 1090. Richard and Rohais' children managed to involve themselves in a great deal of the intrigue referred to in the introduction - Roger and Gilbert were present at the murder of William II in 1100, and the unknown daughter was married to Walter Tyrol, who was William's murderer. Gilbert had also been involved in rebellion in 1088 and 1095, so it would seem that the de Clare family were keen to establish a leading role in British politics from an early stage. The third of Richard's sons, named Richard after his father, seemed more content with his lot, as he is not believed to have been involved in any such high level intrigue as his siblings; saying this however, his son Gilbert kept up family tradition through being one of the twenty five barons involved in the administration of the Magna Carta in 1215. The younger Richard also married Amicia, daughter of the Earl of Gloucester, inheriting the title and passing it down through an unknown son after his death in 1217. Five sons and one daughter were born to the Gilbert de Clare present at William IIs death; his son Gilbert became the powerful Earl of Pembroke, holding and expanding lands in Wales and Ireland; Pembroke's son Richard earned the battle name "Strongbow", presumably for carrying on his families traditional prowess in battle. One of the other five children of the Gilbert present at William IIs death was Richard de Clare, who died giving battle to the Welsh in 1136 - but his son Gilbert strengthened the family's hold on the Marcher lands of the Welsh border by becoming Earl of Hereford. Pembroke's son Richard first earned his reputation as a warrior by taking a force of warriors to Ireland, where he stormed the Norse-Irish city of Dublin; his progress in conquest was so successful that Henry I feared that Richard had grown too powerful and ordered him to return to his lands in Wales... Richard stubbornly refused and fought on. Eventually, his allies submitted to Henry's demand and Richard had to follow suit, however, after reaffirming his allegiance to Henry, a large force returned to Ireland and Richard held control over the lands of Leinster. He also found time between conquering Ireland to father two children, Isabel and Robert; Isabel married William Marshal and their daughter Isabella wed the younger Gilbert de Clare, Earl of Gloucester. This reunited the two branches of the de Clare family early in the thirteenth century. 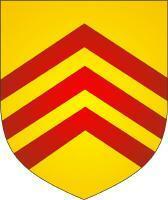 Gilbert and Isabella had three sons and three daughters, of which Richard inherited the title Earl of Gloucester. Richard Earl of Gloucester married the Earl of Lincoln's daughter Maud, and this marriage resulted in two sons - Thomas and Gilbert "The Red", who was entitled Earl of Gloucester upon his father's death. Born in 1243, Gilbert rose to become one of the most powerful and influential men in England at his time; he used the strife of the mid thirteenth century Baronial Wars to his advantage - siding first with Simon de Montfort at the battle of Lewis in 1264, and afterwards with Henry II and Prince Edward. Indeed, the Earl of Gloucester played a crucial role in the defeat of de Montfort's army at the battle of Evesham the following year, and used the opportunity to strengthen the family's position in the Welsh borderlands. Like Richard "Strongbow" de Clare had achieved in Ireland, Gilbert "The Red" managed to firmly establish new lands in the former Welsh principality by strength of the sword and diplomacy with the king. Gilbert sealed his favour with the royal household by divorcing his first wife Alice in 1271 in order to marry Joan of Acre - Joan was the daughter of the newly crowned Edward I. As mentioned above, the de Clare family profited from playing a major role in Edward's conquest of Wales in the 1270s and 1280s; much of the land taken from the Welsh Princes was bestowed upon the de Clares, and although Gilbert "The Red" died in 1295, his second marriage had given him three daughters and a son, also named Gilbert. This Gilbert was apparently admired as a courteous and honest man... given the behaviour of some of his ancestors, wits may like to assume that Gilbert's personality came from his mothers' side of the family! However, like so many of the de Clares before him, Gilbert was a brave and fierce fighter; he loyally supported the king, and fought and died for Edward II at Bannockburn against the Scots in 1314. p> The premature death of Gilbert in 1314 brought an end to the male line of the de Clare family, but his father and Joan of Acre's three daughters were all to be involved in significant marriages. This was probably due to the fact that the vast fortune acquired by the de Clare family was now divided between the three sisters, to be spent on a first come, first served spending spree by whoever the King granted permission to marry the daughters. Margaret was married to Piers Gaveston, close attendant of Edward II; upon Gaveston's untimely death, Margaret was married to Hugh Audley. There has been speculation that Margaret's marriage to Gaveston was intended to prevent rumour spreading as to the nature of his relationship with Edward II. The second daughter, Eleanor, was married to Hugh le Despenser - who replaced Gaveston as Edward's favourite, and cost Eleanor he marriage. Le Despenser was later beheaded with his father in 1326. Eleanor went on to marry William la Zouche. Elizabeth was the eldest of the three daughters, and as such inherited the title of Lady of Clare. Of the three daughters, she had the busiest time, as she was married no less than three times - John de Burgh first, then Theobald Lord Vernon, and finally Roger Damory. After the death of her last husband, Elizabeth used a large portion of her remaining wealth to endow Clare College in Cambridge in 1338; if she had not done so, the College (then known as University Hall) would have closed only twelve years after its foundation. Some sources claim that Elizabeth had a grand daughter from her marriage to John de Burgh, named Elizabeth. This Elizabeth grew up to marry Lionel, the son of Edward III, and their son was to become king Edward IV; surely it would have pleased the earlier de Clares if this was the case, as one of their kin finally became the singularly most powerful man in Britain during his life time - a feat many of the earlier de Clares seem to have devoted a lot of their time attempting! As you can see, the de Clares certainly had a hand in determining the course of events in medieval and later British history - not just that of England, as the strength of their conquests in Wales and Ireland undoubtedly helped establish an Anglo-Norman rule in these areas. Although maybe not one of the most famous or most common names in Britain, the de Clare's habit of drifting in and out of the medieval political spotlight certainly makes for an interesting ancestry; it is also interesting to note that certain family members seemed to "pop up" in the right places at crucial points in determining history... whether this was by chance or astute intention is not for me to say! Despite the wealth and importance of the de Clare family in the medieval period, little remains to be seen of the family; certainly the surname no longer remains an especially common one, as the last surviving de Clares were all daughters. However, illegitimate children were not uncommon amongst the nobility during the medieval period, so many links to unrelated family names may exist unknown even today. The family castle from which they took their name remains in the form of a ruin in Suffolk; the priory they built in St Neots now lies underneath a car park and a newsagents. The strongest links to the family still to be seen are probably Caerphilly Castle (above right) - a majestic ruin in south Wales, Clare College and Clare Bridge in Cambridge; the bridge was built in 1639-40, but was named in remembrance of the Lady who saved the College from closure 300 years before.